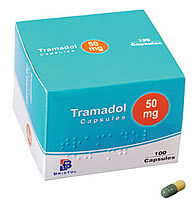 Possible side effects of Tramadol (Ultram) may include dizziness, diarrhea, drowsiness, constipation, headache and anxiety. More serious side effects include agitation, fever, hallucinations, seizures, and a blistering skin rash. These side effects often resolve on their own during treatment, but in some cases these side effects are not worth the benefits the patient receives. In these cases, physicians may choose to alter the dosage or prescribe a different medication. Patients taking extended release tablets (Ultram ER) may notice a reduction in side effects as their bodies become used to the medication, but this is not always the case. Patients are urged to use the lowest dose possible in order to lower the occurrence of side effects. Some of these side effects are more common in patients with certain medical conditions, so these patients should be monitored very closely for adverse effects. Any side effect that is severe or bothersome should be immediately reported to a health care professional, but breathing problems and allergic reactions can be life threatening. Patients experiencing these should go to the nearest emergency room or call for paramedics in order to avoid more serious complications or loss of life. The FDA has approved tramadol and Ultram for use in adults and children aged 16 and older. Some physicians may prescribe tramadol to younger children in certain situations where its use is more favorable than other medications. In the United States, there have not been enough studies in children to determine any long term side effects of Tramadol that the use of the medication may have, so it is best for children to use this medication at the lowest dosage and for the shortest period of time possible. Studies in other countries have shown that tramadol is very effective in pain management for children as early as toddlerhood, and doctors are closely monitoring the patients that were treated for long term effects. As with many medications, Tramadol side effects may be magnified when the medicine is used in elderly patients. Of these tramadol side effects, mental confusion is often the most apparent. Elderly patients with dementia or Alzheimer’s disease may exhibit increased symptoms of confusion or agitation while taking tramadol. The incidence of serious Tramadol side effects increases with the patient’s age; physicians and caregivers are encouraged to closely monitor elderly patients for these. Seizures are a very real concern for elderly patients taking tramadol for pain relief and the medication should be discontinued in this age group if this or any of the other tramadol side effects become a concern. Tramadol has arguably been one of the most significant developments in pain management over the last few decades. Understanding Tramadol side effects can greatly reduce the chances of experiencing adverse reactions during a course of treatment with this medication.